What was the first piece of sheet music that you bought? I don’t remember the first piece I purchased specifically, but I can tell you the music that means the most to me. I have several pieces that I learned while studying with Dr. John Boulton and David Fedele at KU. I love having their markings and wisdom on the music. I often look back on them while teaching these pieces to my students and remember them both very fondly. If you had to choose another musical instrument to play, what would it be and why? I can’t choose one. 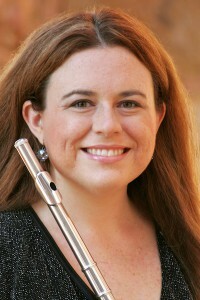 I have wanted to be a flutist since I picked up the instrument when I was 10 years old. I can honestly say that I knew even way back then that flute was going to be my future. What do you consider your biggest accomplishment to be as a musician? I am proud of many things that I have accomplished in my years playing music, however, more than pride, I feel so incredibly lucky that I get to play and teach music every day. Not everyone gets to make their living doing what they love most of all. If you could put together a quartet of three other musicians, dead or alive, to play with, who would you choose and why? I have had the great fortune of being in the professional trio Allegresse for almost 10 years. Margaret Marco, oboe and Ellen Sommer, piano, are two of the most musical people I know. We clicked perfectly from the first rehearsal and have had many wonderful adventures together. I can’t imagine any other musicians, past or present, I would rather play with. They are my musical soul sisters. What has been your favorite Lawrence Community Orchestra experience? Being primarily a chamber musician, I don’t get the opportunity to play in an orchestral setting very often. I love the orchestral repertoire and the feeling of being a part of such a great Lawrence tradition.